Established in 1952, Panaceum Medical has been serving the community for many years. Located in the Panceum building at 233 Lester Avenue we have a dedicated team of male and female GPs, nurses and support staff focussed on providing the very best health care for our patients. Our Panaceum Centre provides clients with access to a wide range of health services in one convenient location, enabling better coordination of care for clients. Monday, Wednesday, Friday 8.00 am – 5.00 pm. Tuesday, Thursday 8.00 am – 6.45 pm. Saturday 8.30 am – 12.00 pm. Open Saturday mornings 8.30am – 12.00pm. Phone 9920 8111 for an appointment. Routine appointments are ten minutes. If you feel you need a longer appointment, please let the reception staff know this when booking the appointment. Your doctor may occasionally be delayed. You can always ring to know if your doctor is running on time. Please try not to be late for your appointment as this means other patients will be subsequently delayed. Our practice has a doctor on call everyday. We will endeavour to see our patients on the same day if the patient considers their problem to be urgent enough. If you are admitted into the SJOG hospital, your usual doctor, or a doctor from the group will take over your care the next working day. We are a mixed billing practice, with our doctors charging both Bulk Bill fees and Private fees. We offer discounted rates for Pensioners and Health care card holders. If you cancel your appointment, please do so at least 24 hours beforehand so that another patient may use that appointment. Late cancellations or missed appointments will incur a cancellation fee. Emergency Department, Geraldton Regional Hospital, Shenton Street. Phone 9956 2222. People in remote, regional and outer metropolitan areas of Australia have access to specialist video consultations under Medicare. This can provide easier access to specialists outside of Geraldton. Ask us for more information about this service. If you need to see a doctor or have tests regularly you could end up with high medical costs. The Medicare Safety Net is designed to help you when you need it most. Contact Medicare for more information. All patients’ personal information is stored on computer with doctors having password access. Personal files are stored away from public access or direct view, in a coded system approved by the RACGP. Copies of patient’s records are kept until the patient has reached the age of 25 or for a minimum of 7 years from the time of last contact with the patient, whichever is longer. 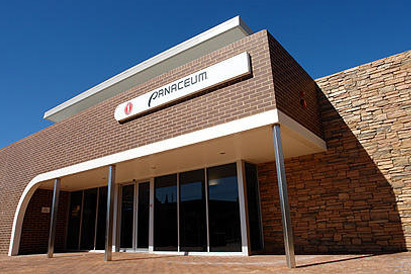 Panaceum Medical, besides being a General Practice, provides specialist services on-site: Registered Nursing Treatment, Pathology, Urinalysis Dip Testing, Spirometry, Audiology, Well Men’s and Women’s Health Checks, Travel Advice, Immunisations, Obstetrics, Anaesthetics, Minor Surgery and Hormonal Implants. All medical instruments are sterilized on-site according to RACGP sterilisation standards. We are an AGPAL accredited medical practice. This practice is actively involved in the teaching of medical and nursing students. If students are in-room with the GP, patients are informed prior to the consultation and given the right of refusal. Always contact us for your results. Don’t assume no news is good news. Please ring between 9am – 3pm Monday to Friday. A recall and reminder system is in place for abnormal test results and other follow-ups. A change table and other facilities for parents with babies are available in the toilet blocks. The Panaceum Group has a policy to see unwell children the day that contact is made. Wheelchair access is provided to all rooms, including the toilet, which has special facilities. A wheelchair is available to transport patients to or from your vehicle. Please let our receptionist know if you need translation services. We also have a number of doctors available who speak foreign languages. Thank you for not smoking on our premises. Talk to us if you need help with quitting. We value your comments, as we keep striving to improve our service! Suggestions, compliments or complaints should be forwarded in writing to our Practice Manager, P.O. Box 7, Geraldton WA 6531. For any matters we cannot resolve or should you be unsatisfied with resolution of your complaint please contact the Health and Disability Services Complaints Office’s (HaDSCO). Phone (08) 6551 7600.